It’s spring already, and the budding trees, sunshine, and warm temperatures are making the air electric! If you’re like us, you’re eager to venture out, do some spring cleaning, and get some fresh inspiration and design tips for a new season. And there’s no better time for it than now: the web is abuzz with new ideas! Have you heard of Pinterest or Houzz? Two words that would have sounded like nonsense a year ago are now a couple of the biggest names in social media! These networks enable you to create profiles where you can gather online imagery into groups. By saving photos or sites you like, “Pinners” and “Houzzers” can share unique tastes with others and accumulate inspirations that may influence your own project later on. Take a closer look at a couple of Synergy’s profiles below. Also check out an amazing kitchen remodel that we just finished, featuring a traditional style. Even without any changes to the floorplan, new finishes and fixtures gave the space a bold new look. Last, our exploration of unique commercial design continues in a new article by proposing a few specific ideas to help your workplace bloom. all that’s needed to complete the space! “Before” and “during” photos of the soon-to-be Chasin’ Tails cajun seafood restaurant give you a behind-the-scenes “sneak peak” into the process of commercial construction. Check out the cool color palette of sea blues and vintage browns, combined with a wood-paneled bar evoking an old dock. Other unique features include sleek glass pendants, a huge bar for sports lovers, and an attention-grabbing concrete sink “wash station” for messy hands right in the dining room. 2011 Contractor of the Year (CotY) Award for Leesburg Kitchen! This past month, we were thrilled to receive a Contractor of the Year (CotY) award in the “Residential Kitchen $50,000 to $100,000” category. 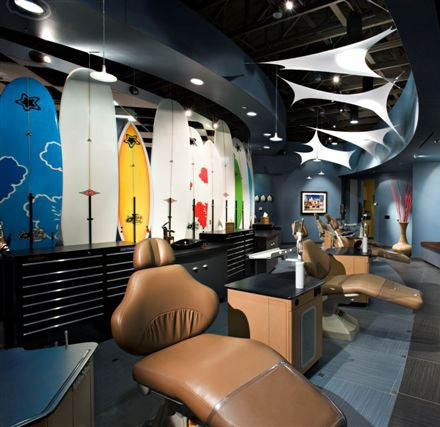 CotY awards are issued by the National Association of the Remodeling Industry (NARI), and recognize excellence in aesthetics, functionality, superior craftsmanship, and the meeting of client needs. This stunning Leesburg kitchen garnered the second place “Merit” award, in the most competitive category of 22 entries! See photos of the award-winning kitchen here! 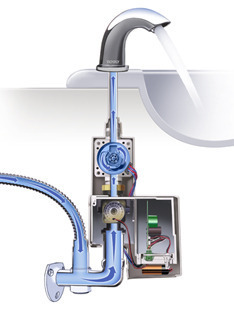 The Toto Eco-Power faucet uses a turbine to power itself. Take a look at this innovative product from Toto that brings the environmentally friendly aspects of automatic faucets to a whole new level. According to the website, the faucet is “engineered to require no electricity or routine disposable battery replacement”; instead, it uses a small turbine in the pipes to capture energy from the water flowing through it. The high-efficiency energy cells complete their charge with as few as 5 uses, and while the faucet comes with a battery back-up, its life expectancy increases dramatically with increased faucet usage. An ingenious idea for saving both water and electricity! If a renovation is on your to-do list, you probably have a lot of questions and don’t know where to start. Why not let us help you get that project complete? How do we do it? We use our Renovation Road Map™! We developed this system to help you understand the remodeling process, navigate the journey from beginning to end AND we save you time, money and frustration. Interested in learning more? 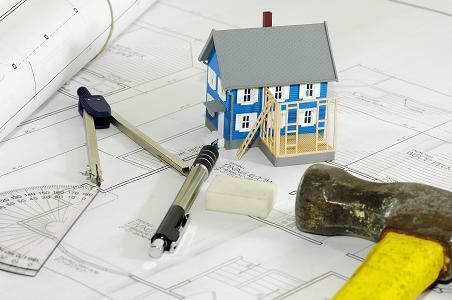 Please contact us today at 703-766-6333 or visit us at www.renovatehappy.com and we’ll get you started on your roadmap to a successful renovation.